The Gowden Horde (Tatar: Алтын Урда Altın Urda ; Mongolian: Зүчийн улс‎, Züchii-in Uls; Roushie: Золотая Орда) wis a Mongol an later Turkicized khanate, established in the 13t century, which comprised the northwastren sector o the Mongol Empire. 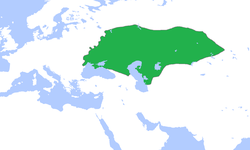 The khanate is an aa kent as the Kipchak Khanate or as the Ulus o Jochi. This page wis last eeditit on 27 Dizember 2016, at 09:04.